U.S. Renews Temporary Protected Status For Some Syrians : The Two-Way In 2012, Syrians living in the U.S. were shielded from having to return to a country embroiled in war. Those protections were extended Wednesday, but only for Syrians in the U.S. since Aug. 1, 2016. 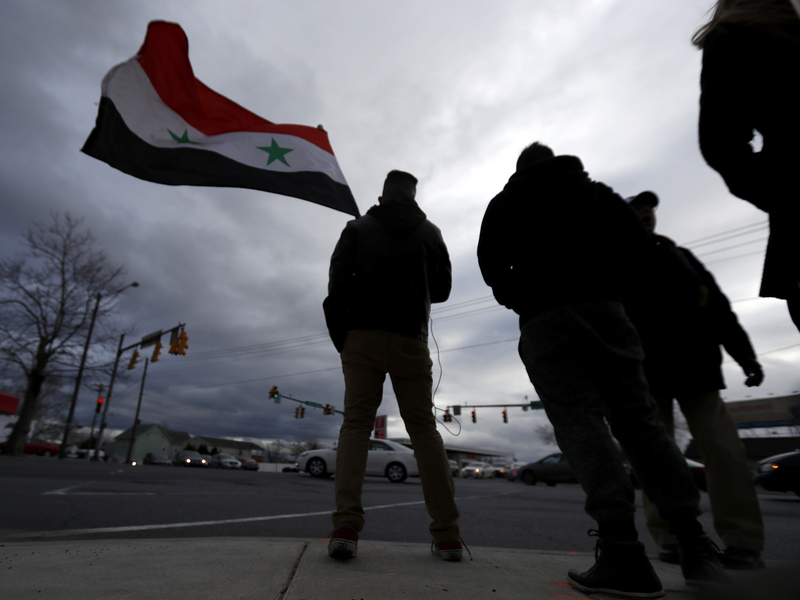 A man waves a Syrian flag during a rally last year in Allentown, Pa., which has one of the largest Syrian populations in the U.S. In 2012, as Syria's internal unrest deepened into full-scale civil war, Syrians living in the U.S. were offered an opportunity: If they met certain conditions and paid the requisite fees, they could register for temporary protection from deportation — and avoid having to return to the violence that awaited them back home. On Wednesday, the Department of Homeland Security announced it is renewing that program, known as temporary protected status, for an additional 18 months. Syrians can re-register if they have resided in the U.S. since Aug. 1, 2016, and have been physically present in the country since Oct. 1, 2016. "It is clear that the conditions upon which Syria's designation was based continue to exist, therefore an extension is warranted under the statute," said Secretary of Homeland Security Kirstjen Nielsen in a statement. NPR's Deborah Amos notes that about 2,000 Syrian visa holders who arrived since 2016 are not covered. As of last October, nearly 7,000 Syrians were covered under the program, which shields people from certain countries racked by war or natural disasters. Under TPS, protected immigrants can live and work in the U.S. without fear of deportation if they pay hundreds of dollars for permits every 18 months. The Trump administration in recent months has announced an end to such protections for people from Haiti, Sudan and Nicaragua. The Obama administration extended the protection to Syrians in March 2012, amid the deepening civil war that continues there to this day. Nielsen faced a Wednesday deadline to either re-designate their status or end the protection, meaning Syrians would have had to seek another avenue to remain in the country legally. Syrians are far from the only nationals protected by the program. In total, the Congressional Research Service estimates more than 317,000 people from 10 different countries — ranging from Yemen and Nepal to Nicaragua and Somalia — signed up during the previous registration period. The Trump administration has announced many of those protections will end and signaled that it would like others to end, too. Nielsen said earlier this month the Department of Homeland Security will extend TPS just once more for natives of El Salvador, for an 18-month period ending September 2019, before ending the coverage they were initially extended after earthquakes in 2001. Nearly 200,000 Salvadorans — or roughly 60 percent of all people covered by the program — now may choose to seek other means of staying in the U.S. Advocates for Syrians have argued their situation is different from people from other countries who were granted TPS in the aftermath of natural disasters. The reason for Syrians' protection — the widespread violence that descended into full-scale civil war in 2012 and has since left cities in rubble — remains ongoing. And in fact, Syrians in the U.S. had reason to hope for this distinction: When the Department of Homeland Security announced it would end TPS for Sudan in 2018, it simultaneously extended the protection for the country's neighbor South Sudan, citing that nation's "ongoing armed conflict." "It's so hard to imagine that this particular TPS would end given the underlying reasons for it," Doris Meissner of the Migration Policy Institute told NPR's Deborah Amos last week. Still, Meissner, a top immigration official under President Bill Clinton, added that there was good reason to believe a change in policy might be coming anyway: "I will be cautious about it because this administration is doing things very differently."